Few people want to think about what would happen to their families if they become disabled or die; however, planning for these occurrences in advance will reduce potential stress on your family later in life. The right plan can protect the value of your estate and spare your loved ones unnecessary hassles and legal conflicts. This book will take the guesswork out of planning your estate and help you finally understand the complex processes. Your Indiana Wills, Trusts, & Estates Explained Simply will help you glide through this complicated process. This book has been adapted to offer Indiana residents state-specific advice for estate planning. 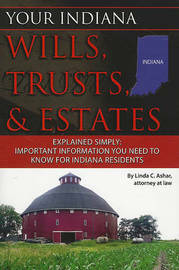 Author Linda C. Ashar, attorney at law, has crafted an estate-planning primer that allows Indiana residents to become more informed and more involved during the process. Your Indiana Wills, Trusts, & Estates Explained Simply will provide all the information you need to choose, set up, and execute a will, trust, or estate. You will learn the legal terminology, including beneficiary, probate, trustor, trustee, assets, guardianship, and executor. You will also learn about trust agreements, trust property, settlement costs, life insurance, durable powers of attorney, marital deductions, gift splitting, survivorship deeds, gift tax issues, generation skipping transfer tax, tax deferred accounts, and advance directives. Atlantic Publishing is a small, independent publishing company based in Ocala, Florida. Founded over twenty years ago in the company president s garage, Atlantic Publishing has grown to become a renowned resource for non-fiction books. Today, over 450 titles are in print covering subjects such as small business, healthy living, management, finance, careers, and real estate. Atlantic Publishing prides itself on producing award winning, high-quality manuals that give readers up-to-date, pertinent information, real-world examples, and case studies with expert advice. Every book has resources, contact information, and web sites of the products or companies discussed.